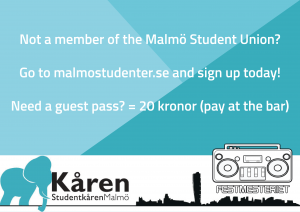 To be able to attend the morepart of our events you have to be a member of the Student Union Malmö. Check in with your valid Studentkortet/Mecenat card with the Union elephant-logo on it (Plastic card or in app). As a member you are able to bring any two guests who aren’t members with you to our events through a guest pass! A guest pass costs 20 Swedish kronor and needs to be reserved an hour before the start of the event. Book one here!